As children return to the classroom, Back 2 School Bingo has a few lessons for bingo players too. Learning has never been more fun and neither has online bingo. Sit up straight in your chair, both hands on the keyboard with today’s subject, recess on the adult bingo playground. The quality of bingo fun has been graded and Back 2 School Bingo receives 5 gold stars. Bingo players pass with flying colors in of the easiest tests ever taken. Back2School is an adorable concept with lesson plans for Chat 101, Bingo Lingo and Chat Etiquette. The homepage is clean and tidy with all the elements of a school motif for the bingo novice and amateur alike. Scribbled on notebook paper are rewards for all new bingo pupils joining. 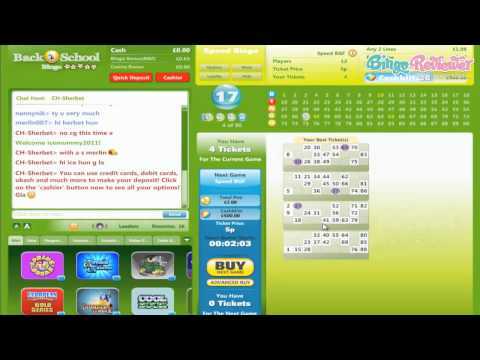 Under the Microgaming brand, Back2School Bingo is lead by the headmaster in online bingo software. Making your way through this bingo hall won’t be difficult with a Tutorial that takes players step by step through each section. You may find yourself lagging behind in awe of amazing Progressive Bingo/Casino Jackpot games, Winners, Promotional offers and easy registration process. Support waits behind the 1940’s inspired telephone ready to assist bingo players 24/7. Put away the standard gym basket balls, soccer balls and tennis balls because the only balls you’ll being playing with is bingo balls. 90 ball bingo offers 5 bingo unique rooms where players will enjoy Speed Bingo, warm friendships, laughter and plenty of sunshine with 8 Free Bingo games each day. The 75 ball bingo offers thousands of bingo patterns in the Ice Breaker Room. Both bingo variations have linked games, chat, side games and auto dab bingo. Personalize your playing experience with a visuals and sounds that best suit you in the Options button found at the top of each Bingo Room. Multi-tasking is easy with over 10 Mini Games to choose from while you play bingo and chat among your bingo roomies. Online Casino Games are extensive and players will never have to stray with all the action under one online bingo site. Roam halls freely among Slots, Table Games, Scratch Cards and Progressive games. While the £1 Free Trial sign up bonus may not seem like much, it is when you consider 1p bingo will give you 100 bingo cards. All new bingo pupils are welcomed after registration with a Deposit Bonus. The Deposit Bonuses don’t end there with a Recurring Match Bonus offering 25% on deposits within £10 - £100 in bingo bucks. If you’re not polished in arithmetic, no worries Back 2 School will automatically take care of the math for you instantly. Since you are in school gold stars are in order for a bingo job well done in the Bingo Ball for Life weekly promotion. Customize your very own bingo ball and express your personality. Players will also have a chance to win a share in the weekly jackpot prize pool valued at £1000. To play simply register your bingo number between 1-90 and bingo on a Full House to win. Academics are important and with the Back 2 School lesson plan in the bingo school of fun, players pass with flying colors. For creativity and games that are state of the art in online bingo we rate them with 2.7 pink stars. I’m not sure why this site received the low rating that it did, but I have certainly enjoyed my time playing there. Yes, their signup offer isn’t anything special but most sites don’t offer anything all that special as it is and when they do there are often strings attached. I really enjoy the theme her, it makes things fun and lighthearted and honestly, when I play, it brings me back to feeling like a kid again anyway so the name is pretty appropriate. I did appreciate their beginner’s luck offer though. It’s a free bingo game where you get the chance to win back your first deposit but it’s only useful if you make a big one, which I made sure to do! For every £10 your first deposit is made up of, you get 1 ticket free. They are also another site that offers the bingo ball for life and any site that offers that is great. Overall, great games, promos and support. Back2School Bingo leaves one wondering at the name, because of course we associate school with schoolchildren. But it's the adults here that believe in lifelong learning and lifelong fun as well, and sending your kids off to school after a long vacation at home, well, that's just fun all by itself so when you throw in Bingo, well, you have instantly gratifying entertainment. We adults do like to play just as hard as the kids do, but we do it in ways like chatting with our roomies and shouting BINGO when we hit that big win! With signing up at Back2School Bingo you get to play and earn bbs which give you more buying power and thus more opportunity and chances to win. I've always enjoyed microgaming slots, and this site is full of them. As a US player I am disappointed to not be able to play here or play at any microgaming site, but that may change as the laws become defined for online bingo across international borders. The slots are very fun and exciting with great features. Would be nice to play and win. Overall looks like a fabulously entertaining and fun site. Good luck to all players I hope that you get a big schooling at Back2School bingo. This is definitely one of the sites on my good list, a place I love to visit often. I always thought that it is not really convenient to associate casino sites with school in any way, but hey, what ever works. I like how the site looks, with a black (or rather, green) board, but it doesn't look that good in high resolution, and that's a place for possible improvement. New players are given a £5 No Deposit Bonus, or rather trial bonus, that you can use to test the games, although if you are lucky enough, you can even get some cash out of it (I have seen very few people that pulled that off). This is a Microgaming site, with 75 and 90 ball games, four rooms in total. I have seen sites with more rooms and better Bingo offer than this one, but I still love to play on Back2School. I always had a good experience with withdrawal, without waiting for long. For every £1 cash wagered in bingo you receive 1 loyalty point.